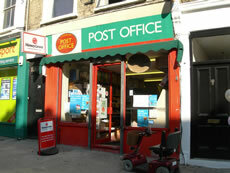 The Churchfield Road Post Office serves an area which is not particularly affluent, has an on average older population and is at the centre of a large hinterland bounded by East Acton Lane, Grafton Road, Horn Lane and the Uxbridge Road. The fact that the area is not affluent means that people walk to the Post Office, there being no public transport criss-crossing the area and if the post office were to be closed older, disabled and ill members of the community would be hard pressed to walk to the market Place post office and then to wait, without seats, in the long queues which are the norm there. Not all have bank accounts into which their pensions can be paid, particularly widows, and they are therefore dependent on the local post office which provides an essential contact within the community for them. Within the area there are four centres for old people. The Almshouses and Goldsmith's Place, Birkbeck Court, the sheltered housing on Spencer and Churchfield roads and Park View. These would not be helped by the closure. There are many octo and nonagenarians and a few centenarians who are dependent on their already elderly children. The post office is crucial to their well being. The post office has its usual functions, is an excellent stationery shop and is affiliated to the very necessary dry cleaning shop. Its owners are well known in what is a close-knit community where people tend to stay and which is the home to long established families whose antecedents came to settle here in the 1870's. This post office serves the community well. It should not be closed. Too many would be cut off if deprived of it. We must fight this closure.